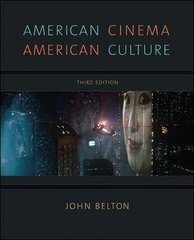 American Cinema/American Culture 4 Edition American Cinema/American Culture looks at the interplay between American cinema and mass culture from the 1890s to 2011. It begins with an examination of the basic narrative and stylistic features of classical Hollywood cinema. It then studies the genres of silent melodrama, the musical, American comedy, the war/combat film, film noir, the western, and the horror and science fiction film, investigating the way in which movies shape and are shaped by the larger cultural concerns of the nation as a whole. The book concludes with a discussion of post World War II Hollywood, giving separate chapter coverage to the effects of the Cold War, 3D, television, the counterculture of the 1960s, directors from the film school generation, and the cultural concerns of Hollywood from the 1970s through 2011.Ideal for Introduction to American Cinema courses, American Film History courses, and Introductory Film Appreciation courses, this text provides a cultural overview of the phenomenon of the American movie-going experience.An updated study guide is also available for American Cinema/American Culture. Written by Ed Sikov, this guide introduces each topic with an explanatory overview written in more informal language, suggests screenings and readings, and offers self-tests.